These last weeks, I have worked a bit with MongoDB. I work on a MacBook Pro laptop and in order to save my battery, I don't like having all my databases servers always up and running. Since I liked the MySQL Preferences Pane very much and there was nothing like that for MongoDB, I wrote it. It is available on Github: https://github.com/remysaissy/mongodb-macosx-prefspane. This is only a preferences pane. It does not embed a MongoDB Server. Therefore, you first have to install MongoDB. The emphasis has been put on the simplicity. Therefore the preferences pane shows the current running state of the MongoDB server along with a single button to start it. 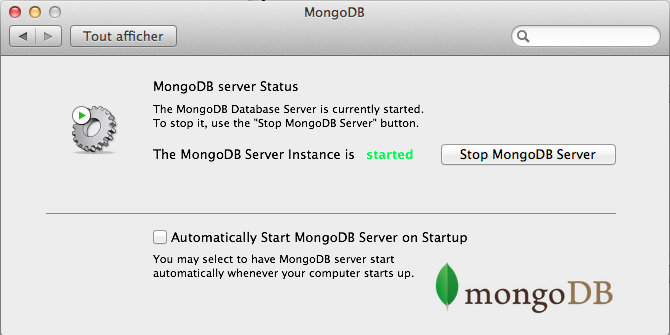 You can also check a checkbox if you want to have MongoDB always up and running. An auto update functionality has also been implemented so you won't have to worry about updating the software, just focus on your own goals!